Whopper's Bunker: Connery may say no to God? God refuses to give up on recruiting Connery for Indiana Jones IV, despite the Scotsman's reluctance to sign on as Henry Jones. 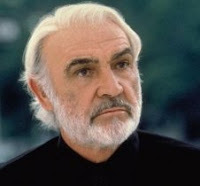 Connery insists he's not that interested in reprising his role from Indiana Jones & The Last Crusade, but that has not deterred a persistent Mr. Lucas, who says, "We're still trying." God admits he was stunned when Steven Spielberg told him he wanted to sign Cate Blanchett as Jones' love interest in the new film. "That's who my director wanted and I always bow to the wishes of my director. I approved it because she seemed like a good idea. When I met her at the Academy Awards, I told her, 'Hey, you work for me now!'". Of course it is an honour for Cate to even speak with him, let alone work for him. "Of course it is an honour for Cate to even speak with him, let alone work for him"
Will she be working under him? Connery? I thought he was dead?